The next generation Vivo Xplay will be named as XPLAY 3S. The Vivo Xplay 3S to be the world’s first smartphone with 2K resolution display (2560×1440 pixels). 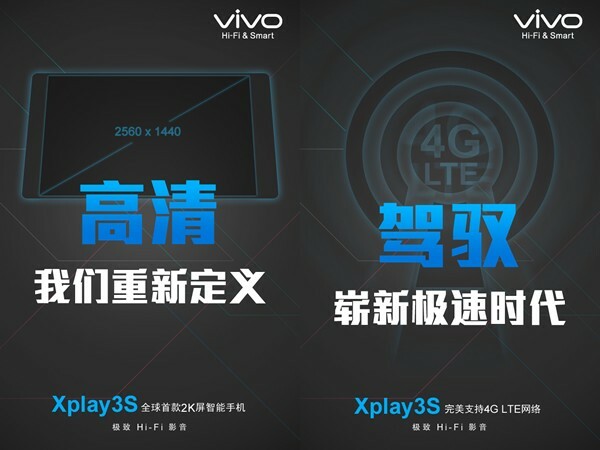 The Full HD 1080p smartphone was launched about a year back by HTC and now a chinese Smartphone maker Vivo is teasing for its upcoming flagship the Xplay 3S. The phone will have 2K resolution display, 2.3GHz Qualcomm Snapdragon 800 AB quad core processor and 4G LTE support. It will feature 3G, 4G LTE, Bluetooth, GPS, WiFi, NFC, and micro USB connectivity. It would run on the latest Android version, 4.3 Jelly bean OS. The full specifications of the phone are still unknownIn mean time check out ViVo X3 T, the world slimmest phone. We will update if something new on Vivo 3S Xplay pops up, so stay tune. TAGS 4G vivo xplay 3s vivo.